How to Convert M4P to WAV? It’s Easy! M4P files could be divided into two different types, respectively Apple Music M4P songs and common M4P music without DRM protected. When talking about converting M4P files to WAV, you will need to look for two unique M4P to WAV converters based on what kind of M4P files you have. To let you get rid of this hassle, today, we will introduce two effective solutions on how to convert two kinds of M4P files to WAV. After that, you can play unprotected and protected M4P songs on WAV compatible music players without problem. Now, you can refer to the right way to convert M4P music tracks to WAV according to the kind of your M4P files. Apple Music songs are not only encoded in M4P format but also encrypted in DRM technology, which limits iTunes users from playing unprotected MP4 songs on Apple-authorized devices and music players only. When it comes to listening to Apple Music songs on other music players, specially for WAV supported music player, the best choice is to convert DRM M4P to WAV. Since WAV files feature with lossless CD quality so that you can get better listening experience. 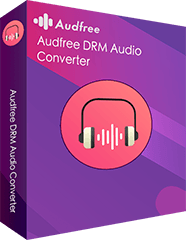 As for the best DRM M4P to WAV converter, here, we can meet AudFree DRM Audio Converter for Windows/Mac, an all-in-one iTunes DRM removal software and Apple Music converter. 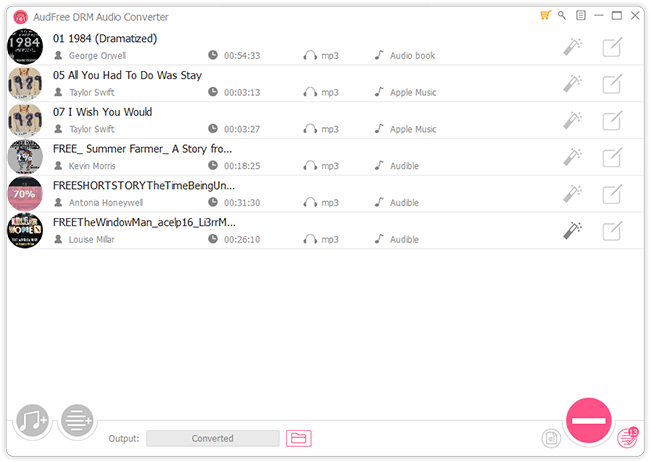 With the assistance of this software, you can convert protected Apple Music to WAV, FLAC, AAC, MP3, etc. while removing DRM protection at the same time. Losslessly convert Apple Music DRM M4P to WAV, FLAC, MP3, etc. 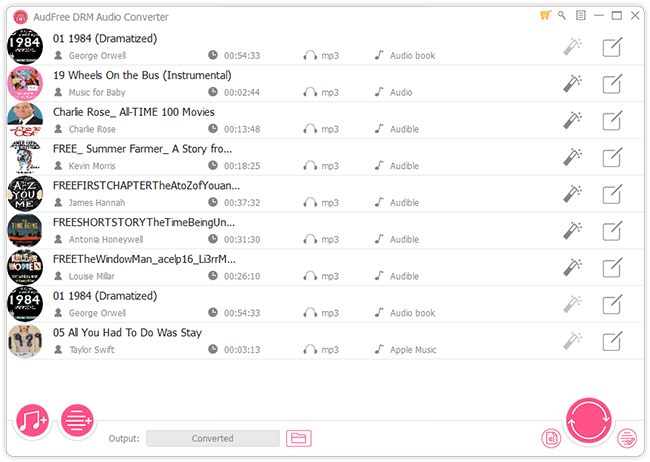 Tips: If you'd like to play Audible books on WAV music player, like Windows Media Player, you can use this tool to transfer audiobooks to WAV for playback. Besides, if your iTunes music files were downloaded after 2009, you can just use iTunes as a WAV encoder to import them to WAV format. Please download Apple Music files completely on your computer. And then you can start to launch AudFree DRM Audio Converter on your computer and drag and drop downloaded DRM M4P files to the main interface to load them. In this step, you can start to customize output audio parameters. Just click the 'audio' icon to open the setting window, where you can define output format as WAV and adjust other audio parameters, like bit rate, sample rate, audio channel, etc. The last step to extract WAV files is to simply press the 'Convert' button at the main interface. AudFree DRM Audio Converter will automatically convert DRM Apple Music downloads to WAV files and save them on your computer. The conversion time could be faster than other audio formats as WAV is a lossless format without compression. If your M4P files are unprotected by any DRM technology, it could be easier to encoded them to WAV. 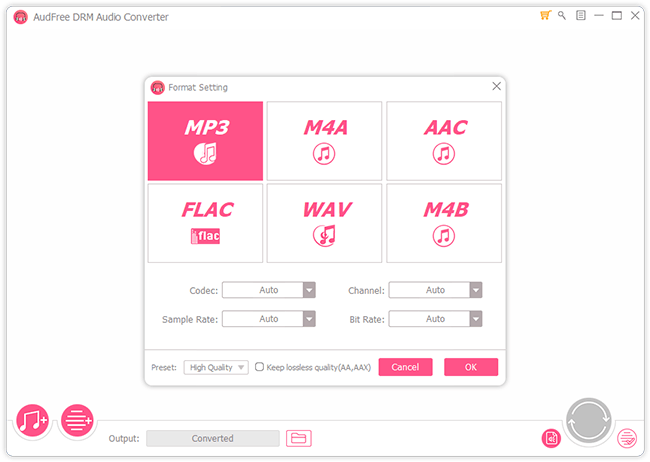 And there are some free online audio converter allowing you to convert M4P audio files to WAV with ease. Step 1. Navigate to FILEZIGZAG official website and open the 'M4P to WAV' web page on your web browser. Step 2. Drag and drop files to the right box or just click the 'Select' button to upload common M4P songs. Step 3. Just click the triangle-arrow button of 'Select type' option to choose WAV as the output format. Step 4. You can hit on the 'Convert' button to start converting process and all files will be saved automatically. No matter you have protected Apple Music songs or unprotected M4P files, you can convert them to WAV with mentioned M4P to WAV converters. Now, you can start to transfer Apple Music WAV audio files to music players that can recognize WAV format for playback, like Windows Media Player, VLC player, Winamp, etc. What's more, you can sync converted M4P songs to any other devices being compatible with WAV files for listening without restriction. Have you known other excellent M4P to WAV converters to convert M4P songs and playlists to lossless WAV with ease? If have, just be free to share them in the comment area to make this article more professional.